There are few streets in the world that are more famous than a little street in Liverpool, in the north of England called Penny Lane. The small lane is famous (if you didn’t already know) for inspiring the 1967 song of the same name by The Beatles. Penny Lane served as a symbol of the lives the Beatles independently and collectively led in Liverpool before becoming the world renowned band that they eventually became. It was this street named after James Penny, that as the song says is off the thoroughfare, that spoke to the Paul McCartney in a way that no other street or area in the city possibly could have. The fireman and fire engine referred to in the lyrics, are in fact located at the Mather Avenue fire station which is close to Penny Lane. The shelter in the middle of a roundabout, is at one end of the street and is now a restaurant (currently Sgt. Pepper’s Bistro). The barbershop where the barber showed the photos of all the heads he had the pleasure to know, is still just a barbershop. Penny Lane is more than just the Beatles though, and there is a colored past that the city has grappled with for many years. James Penny was an eighteenth century slave trader, and like many other “industrialists” of the time, he became quite wealthy from the international slave trade. He at one time owned as many as eleven slave ships and spoke on the record about the topic of transporting slaves through the port of Liverpool, which served as a stopover for slave ships traveling between Africa and the United States. 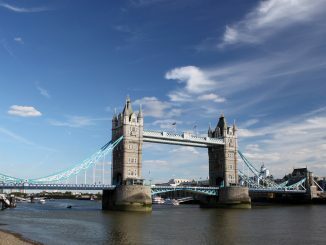 In 2006, a Liverpool councilor proposed renaming Penny Lane and several other streets because their names were connected to the international slave trade and the role that Liverpool played in continuing and prospering from it. 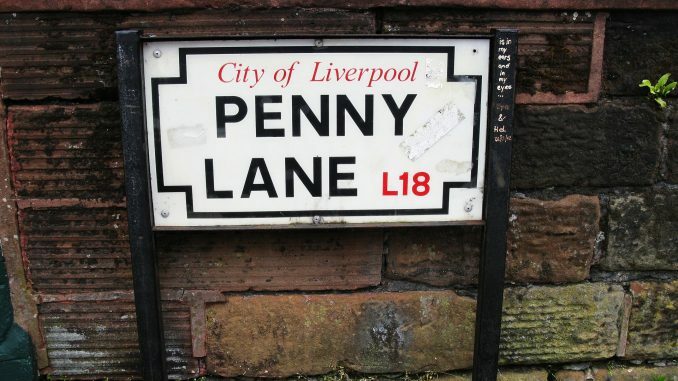 It was decided that because Penny Lane had a stronger connection to the city from the Beatles and less from James Penny, that it would be excluded from the renaming. 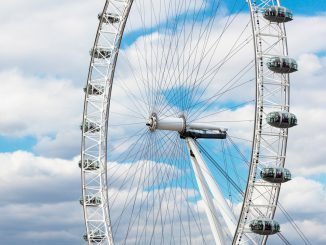 The street has for a long time been a tourist destination and roadside attraction in its own right, and the street signs were constantly being stolen and carted away to the far reaches of the world. There was a time that the theft of Penny Lane street signs was so prevalent that the city began painting the street name on the sides of buildings. It is much more difficult to steal a building than a sign. Since 2007 “theft-resistant” street signs have been in use but they are still sometimes stolen. Penny Lane is roughly half a mile long and runs between Church Road and Greenbank Road. You can get to Penny Lane on the Magical Mystery Tour as well as several other Beatles related tours in the city. There is no shortage of Beatles related memorabilia available along Penny Lane but it is all way overpriced. Penny Lane is a pilgrimage site for thousands of Beatles fans and is an important stop on “Liverpool’s Beatles Trail”. 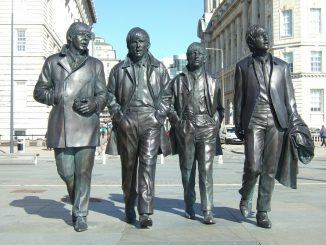 Paul McCartney came up with the idea for the song “Penny Lane” while waiting for John Lennon to show up at the bus stop. Penny Lane is a smaller portion of the Mossley Hill area.